Our boot camp provides lead fitness and fat loss workouts in a fun, supportive community with group training programs. You can always expect a friendly high-energy workout while making friends and being part of a TEAM environment! We are the #1 fitness and fat loss program Guaranteed to burn the fat and get you in the best shape of your life! Baltimore’s ONLY indoor turf field boot camp, with an additional 6,ooo sq. ft. of functional training space allows us to implement personal training quality workouts in a group setting for a fraction of the cost of standard personal training sessions. The difference between BeMORE Boot Camp and the average personal training gym is that we don’t limit ourselves to one treadmill, one squat rack or one piece of any of our exercise equipment. We have 5 or more of each! This allows us to utilize the benefits of different kinds of equipment even in a group workout, maintaining high standards while controlling proper form and technique throughout the entire workout. 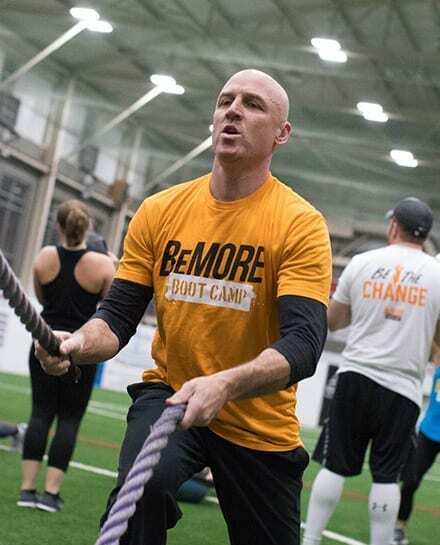 Unlike ordinary boot camps, which offer little or no equipment, relying only on cardio-based workouts, BeMORE Boot Camp provides a comprehensive Strength Training and Sports Style Conditioning program at its best. BeMORE Boot Camp delivers the ultimate Boot Camp experience unmatched by any other. It’s equivalent to personal training in a group setting, but costs only a few dollars per workout, with results that are 100% Guaranteed, or your money back! I started off playing multiple sports at age 6 which helped develop my mind and body for athletic challenges that would carry me thru the collegiate level. All while creating lifelong experiences and moments that will never be forgotten. Along the way I developed a love and passion for fitness, working hard, athletic training and building solid relationships thru team oriented environments. I started at a big box gym in Baltimore and built solid business relationships that helped me acquire the skills for being a true fitness professional. I then started my own in-home/condo personal training business. Pieces of each of these valuable and unique experiences have come together to allow me the opportunity to bring you BeMORE Boot Camp. My fitness philosophy is about functional fitness— meaning it’s applicable to real-life movements, like sprinting, lifting, pushing and pulling. Doing something that’s going to get you stronger for everyday life. Ultimately, making everything you do that much easier! Hint hint – feeling younger! My goal is to provide fun, innovative fitness methods and premium services for a diverse clientele. By establishing realistic goals, prescribing progressive exercises to minimize injury and maintaining a fun and enjoyable atmosphere, I will strive to be a vital presence in the growing force of change!